Bedspread just as described. Comforter is soft and lightweight! I also love the design and the fact that its machine washable !! Definitely a must in my dog filled house ! Give your bedroom a comfortable farmhouse look with The Curated Nomad's Natoma Cotton Jacquard Comforter 3-Piece Set. The ivory cotton comforter features horizontal stripes, in charcoal hues, with eyelash-looking woven details that add a charming accent to the top of the bed. Hidden bartacks create a clean, duvet-like finish on the comforter, while matching shams mimic the design seen on top of the bed completing the cotton jacquard bedding set. Made from 100-percent cotton, this jacquard comforter set is machine washable for easy care and provides a causal allure for your bedroom decor. This comforter set was exactly as purchased! High quality, looks and feels amazing! Bought the matching throw pillow as well and love it! WONDERFUL comforter set! It looks even more beautiful in person. We have had for about 5 months now and it is holding up great. Decided to accent with navy and the color combo is stunning. Absolutely love the look of this comforter! It fits perfectly into our bedroom. The look is very similar to what is shown! I would absolutely recommend this to a friend! This set is very nice for my king bed. It gives the a feeling of wanting to make my bed every day! It’s durable, very well made, and shipped on time. I would order it again! Great quality, I love this comforter! LOVE LOVE LOVE! This comforter is everything I wanted and more! I was worried that when I got it, it would be another flat comforter, but it isn't! it has tons of volume to it! Absolutely gorgeous!! No complaints! Perfect four our teen daughter's room! The texture of the comforter gives it a very high class feel. She's so thrilled with her new bedding! 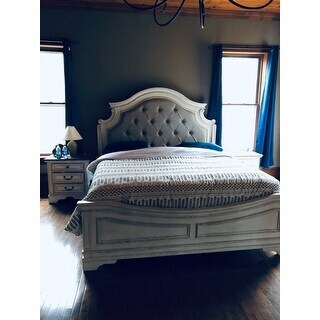 I bought this for a spare bed and I really love the feel of it. I wish that I got it for my bed lol. I'm really picky about what I buy or how something feels, but ordering online on little time for family to spend a couple of weeks, there was literally no time for me to go shopping. Exactly what I wanted! Charcoal curry and a cream color, not sure why the description says brown. It’s definitely grey, the pictures are accurate. Really soft and not too heavy. Very flimsy and thin. Not worth the price. LOVE THIS! It's prefect for the room. Once again, I'm really happy with INK+IVY products! "Is the pattern printed on or does it have a raised texture?"